Facilitate Executive Retreat and THEN engage full resort staff TEAM in an interactive conversation around spotting, embracing and leveraging changes that are impacting them all. The Challenge: In 2017, Cliff House reemerged as one of the most captivating waterfront destinations of its kind following a landmark transformation. This iconic Maine resort, which welcomed its first guests in 1872, inspires a new community of travelers today with remarkable sightlines, intuitive amenities, and emotionally rewarding encounters. With new ownership and its first high season approaching, resort leadership wanted us to help engage its 300+ employees around how to internalize and operationalize its organizational values, business objectives and expectations of how to bring the Cliff House brand and service philosophy to life. 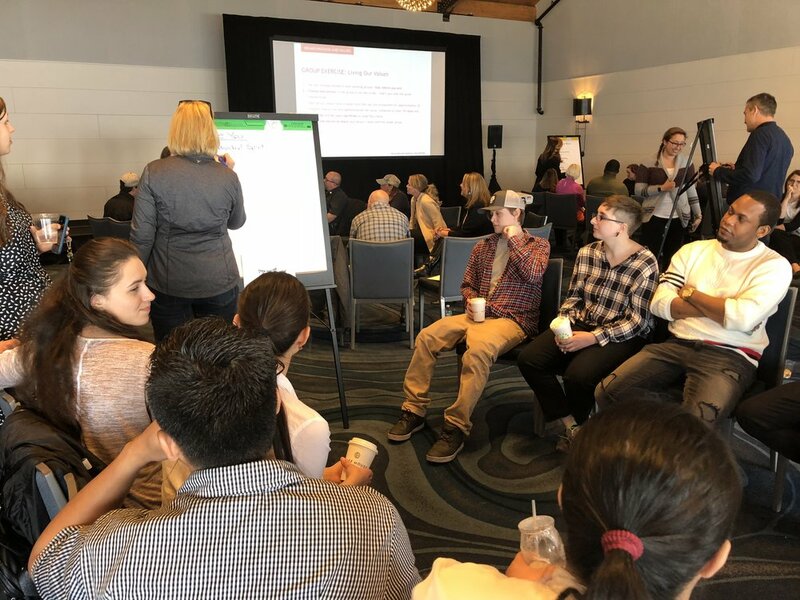 The Outcome: First, we met with Cliff House General Manager Nancy White and her Executive Committee (EC) in early February 2018 for an intensive one-day values mapping, strategy development, and team-building workshop. We then leveraged insights, agreements and prioritized action items from that session to design a subsequent all-staff retreat that spring where EC members shared key metrics and other important information that would help everyone to be at the top of their game and ensure a successful season at full capacity. Cliff House GM Nancy White kicks off with a celebration of our progress to date! Then, Ruth Wieder used organizational cartography to digitally map a spirited conversation and series of engaging facilitated exercises designed to help the team develop a guide for living its values and building enduring loyalty. Finally, we facilitated a smaller session for the newly formed Staff Steering Committee to help them develop and test a decision-making framework that would enable them to build consensus, prioritize decisions and make creative and effective recommendations to senior leadership. Update: In February 2019, Nancy White invited us back to once again facilitate her Executive Committee retreat. Over the course of two days the newly constituted EC strategized about how to glean clear insights from employee engagement surveys, plan and prioritize actions for adhering to the organization’s decision to adopt the Forbes 5-Star Service Standards, made key decisions regarding the transition of the resort to its new management company and collaborates to recover stolen art (in a fun escape room challenge! ).